The Amiga PCB Explorer is a browser application that was designed to assist people in various aspects of Amiga mainboard repairs. Look up signal paths where physical traces have been damaged by battery acid or capacitor leakage. Find out which components are connected to the same signal net. Get a quick overview on chip pinouts. Locate any part on the PCB. The previous version used popup windows to display information. A lot of users didn't really like these as they occupied too much screen space and were the cause for a number of bugs. In this release, the windows are completely gone and replaced with a more minimalistic approach. 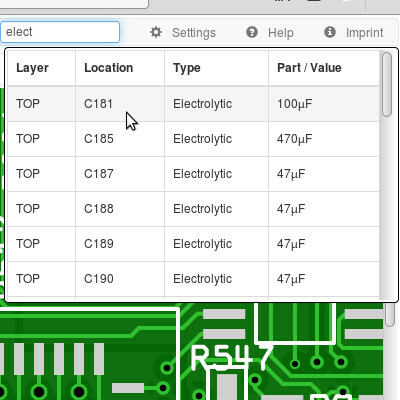 The PCB Explorer is now focused more on tracing signals instead of component information. The schematic viewer and component information (pinout, documents) have been temporarily removed because they didn't really fit in the new UI design. The data on this website is provided as-is and is NOT guaranteed to be error-free. Use at your own risk. This is a private, non-profit website for personal use only. Commercial use strictly forbidden. Please do not try to mirror this page (wget etc.) - the content is generated dynamically, so mirroring just won't work and will cause lots of unnecessary network traffic on both sides. amigapcb_session for session handling. This cookie is deleted when closing the browser window. amigapcb_config stores configuration settings. This is a permanent cookie. The web server that runs PCB Explorer generates log files that contains the client's IP addess, timestamp and the URL being accessed. This information is used for diagnostic purposes and traffic statistics. Each log file is stored for 30 days and deleted afterwards. No information contained in these logs is submitted to third parties. The PCB Explorer has been primarily designed for desktop computers and may not work on mobile devices. Using this application may generate a lot of network traffic, please keep this in mind especially when using a mobile connection. Use the upper menu bar to adjust the view port, you can select the zoom level, top or bottom board view, PCB colour and enable or disable board layers. You can search for part locations (U400, R123, ...), types (Resistor, Electrolytic) and values (100pF,68R) by using the search field on the right. If you click on an entry, the corresponding part will be brought into view and its outline will be flashing. The result list will be cleared once the mouse pointer is placed outside. Use the mouse to navigate over the PCB area. Place the cursor over a pad or via to get details on the part, its value, pin number and connected signal net. This information is displayed in a small popup next to the mouse cursor. If enabled in the configuration, connected traces will be highlighted, too. 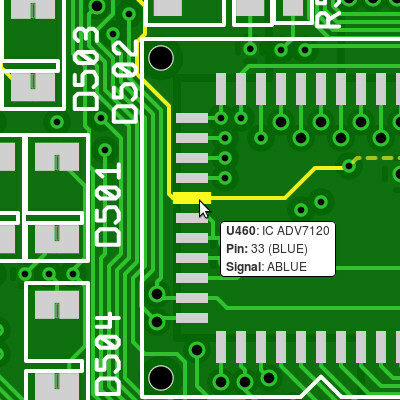 By clicking on a pad or via, the selected trace will be marked and the corresponding signal will be displayed in a small tab (with the same colour) above the PCB display. If you move the mouse over such a tab, the signals' net list will be displayed. Click on the small cross to close the signal tab and unmark its traces. If you click on a list entry, the corresponding part will be brought into view and its outline will flash. Up to 16 signals can be marked at the same time. 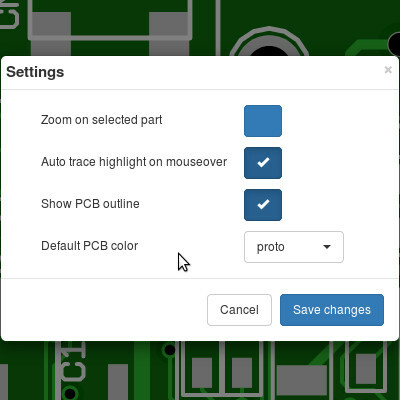 In the settings window, you can adjust the behaviour of the PCB Explorer to your needs. For example, you could disable the board outline (or shape) to resolve possible performance issues on lower end clients. The configuration is stored in a browser cookie named "amigapcb_config". If you delete this cookie, a default configuration will be applied. 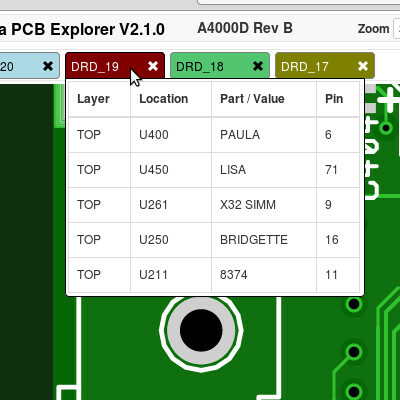 The PCB Explorer has a number of known issues and/or limitations. These will be addressed with ongoing development. Microsoft and Apple browsers are untested and may be incompatible. The application has some display issues on smaller screens and does not work well on touchscreen devices. Part highlighting doesn't work in all cases. Schematic viewer and part pinout list have been temporarily disabled. If you like to throw some money at me, you can use the Paypal Donate button on the front page.